This page provides an overview of copyright rules of Angola relevant to uploading works into Wikimedia Commons. 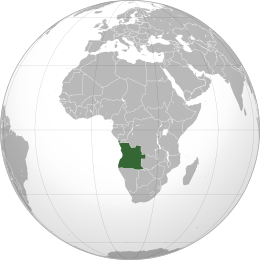 Note that any work originating in Angola must be in the public domain, or available under a free license, in both Angola and the United States before it can be uploaded to Wikimedia Commons. If there is any doubt about the copyright status of a work from Angola, refer to the relevant laws for clarification. Angola was a Portuguese colony until 1975. Angola has been a member of the World Trade Organization since 23 November 1996, as well as a signatory to various other international treaties. As of 2018 the World Intellectual Property Organization (WIPO), an agency of the United Nations, listed Law No. 4/90 of March 10, 1990, on Author's Rights as the main copyright law enacted by the legislature of Angola. WIPO holds the text of this law in their WIPO Lex database. In 2014, the Angolan National Assembly passed Law n.º 15/14, de 31 de julho - Lei dos Direitos de Autor e Direitos Conexos, which replaced the previous 1990 copyright law. The new law came into effect by Presidential Decree 125/17 on 12 June 2017. Not OK No exception for currency in the Angolan copyright law. ↑ a b Angola Copyright and Related Rights (Neighboring Rights). WIPO: World Intellectual Property Organization (2018). Retrieved on 2018-11-03. ↑ Law No. 4/90 of March 10, 1990, on Author's Rights. Angola (1900). Retrieved on 2018-11-03. Law on Authors' Rights (No. 4/90 of March 10 1990) (in English) (1990). Retrieved on 2018-12-04. ↑ Lei n.º 15/14 de 31 de Julho (Angola Copyright Law).